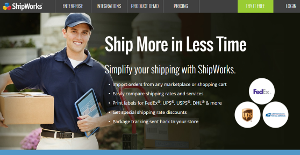 ShipWorks is a shipping software for eCommerce websites and businesses designed to expedite and simplify tedious tasks and processes related to shipping, including order management, fulfillment, and delivery to name a few. This shipping solution caters to businesses of all sizes and is widely popular for its simplicity, ease of navigation, and efficiency. To help streamline shipping workflows, ShipWorks seamlessly integrates with over 70 different eCommerce platforms, payment channels, and mail carriers. The list includes PayPal, Etsy, FedEx, USPS, Bigcommerce, 3dCart, and more. With ShipWorks, users can automate and schedule any shipping tasks, as if putting all your shipping process on autopilot while you grow your business. ShipWorks simplifies all shipping processes and workflows for eCommerce companies and websites, enabling them to accelerate all their tasks and improve their efficiency without compromising the quality of work. The solution automates many tedious tasks, synchronizes customer information across multiple platforms and applications, and speeds up the whole shipping process. ShipWorks boasts of massive integrations with more than 70 online marketplaces and shopping carts, making it easy for companies to manage and ship their orders for a variety of sales channels without having to exit the system. Printing labels is quick and easy with ShipWorks, as the software works seamlessly with major shipping companies and carriers including USPS, FedEx, and UPS. Connecting with a shipping carrier is simple as all you need to do is input your account information if you are an existing user or sign up for a carrier account for first time users. If you want to explore your shipping options, ShipWorks allows you to find the best shipping service by automatically comparing services and rates between carriers based on your specifications. With everything automated and information synchronized, you are able to significantly improve accuracy of your shipping labels and schedules. This results in no more errors in your orders and you ship your items faster than ever. Whether your shipping local or international, ShipWorks takes the whole processes and simplifies it. The software generates all the necessary documents for international shipping, such as integrated custom forms, commercial invoice, and certificate of origin automatically. All you have to do is click a few buttons and hit deliver. Since each enterprise has unique business needs, it is prudent for them to desist from searching for a one-size-fits-all ideal software solution. Needless to say, it would be pointless to try to find such a system even among popular software platforms. The intelligent thing to do would be to catalog the various vital elements that require consideration such as required features, finances, skill levels of staff members, company size etc. Then, you should do your homework thoroughly. Read some ShipWorks reviews and look into each of the other systems in your shortlist in detail. Such exhaustive research can make certain you weed out ill-fitting applications and choose the app that presents all the features you require for business success. We realize that when you make a decision to buy eCommerce Software it’s important not only to see how experts evaluate it in their reviews, but also to find out if the real people and companies that buy it are actually satisfied with the product. That’s why we’ve created our behavior-based Customer Satisfaction Algorithm™ that gathers customer reviews, comments and ShipWorks reviews across a wide range of social media sites. The data is then presented in an easy to digest form showing how many people had positive and negative experience with ShipWorks. With that information at hand you should be equipped to make an informed buying decision that you won’t regret. What are ShipWorks pricing details? What integrations are available for ShipWorks? If you need more information about ShipWorks or you simply have a question let us know what you need and we’ll forward your request directly to the vendor.